As our shoes are handmade and all parts are hand-cut, we are able to customize the size and create a pair of shoes that will fit comfortably. We can also accommodate orders for different length or width between feet or change the shape of the toe-box. To customize the size of your pair, it’s best to specify your size in two ways. If you are interested in a customized in terms of size and/or fit DL pair of shoes, pick the "CUSTOM SIZE" from the drop down menu and contact us for a consultation. Please, keep in mind that your shoes might look wider or narrower depending on your foot's length-width ratio. 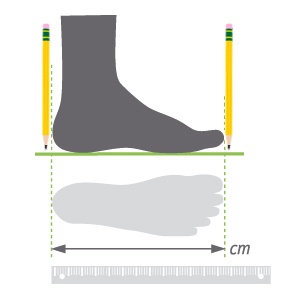 To measure the length and width of your feet, all you have to do is to step on a piece of paper and draw the outline of your foot with a thin, body and tip, pen or pencil, making sure to hold it as vertical as possible to the ground, as tilting it either way might not give the correct results. For optimal results and accuracy, ask someone to outline your feet for you. Then measure the widest and longest points of the traced outlines, as the images below show. For a personalized fit of the footbed, you can send us a true sized scanned image of the paper for us to have the outlines printed out to be used as a basis for our team to create a personalized shape. We can not utilize photographs of the drawn outlines as they are not true to size and usually show distorted length/width ratio. 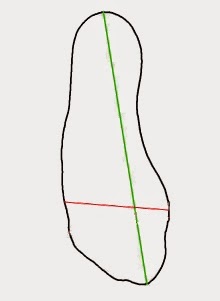 For us to adjust the toe-box shape of your shoes, please provide us with the scanned traced outlines of your feet. In case you are interested in a toe-box that will allow your toes to spread further, please draw the outlines with your toes spread. Keep in mind that this will alter the final toe-box look of the shoes. We know sizes vary widely between shoe brands and we do not rely on the standard sizes to craft your pair but this helps us to cross-check with the measurements or outlines you’ll provide. Let us know one-two shoe sizes you mostly find comfortable in either EU, US, UK or JP/CN systems. Our customer care team is knowledgable on international shoe size scales and shoe sizing in general. We hope this guide to measuring your feet helps you out and brings the confidence needed when buying handmade and custom shoes online! The DL customer care team is informed on human physiology, the various foot types, as well as common foot issues and will help you through to get your personalized fitted pair. Please, contact us for a quote if you require further customization due to bunions, high or low volume feet, narrow/wide heel, ball, calf, differences between feet or other special features. We can accommodate a variety of alterations to original styles and patterns at an additional cost. We are able to craft shoes for feet that measure from 21.5 cm in length to 32 cm. This roughly corresponds to US3.5 /UK 2/ EU34 and up to US15 /UK 13.5 /EU49. Most of our shoe designs can now be crafted in smaller sizes from 26 EU to 33 EU. We are on the way to widening the range of sizes we can craft by expanding our series of shoe-trees, patterns and tools.